The lovely ladies of the only all-female Mardi Gras rock band, Pink Slip, will rock Mardi Gras once again for their 8th annual roll down St. Charles Ave. Veteran chanteuse Susan Cowsill will be at the helm of the funky, colorful Pink Slip float in the Muses and Pontchartrain parades this season. Pink Slip will also play a show, this Friday, January 11 at the Circle Bar, 1032 St. Charles Ave., and during Mardi Gras on February 1, at the Big Top, 1638 Clio St., after the parades. 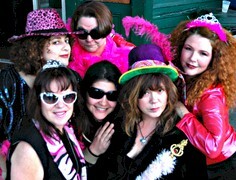 Since 2000, Pink Slip has strictly been a Mardi Gras Band, but the nine member girl band is the original breeding grounds for female rock in New Orleans, with members going on to form various chick bands such as Manwitch and The Hazard County Girls. The members of Pink Slip can change each year, but this years line up includes members of Manwitch, the Polly Plushcats and lead singer Cowsill. Pink Slips straightforward and uninhibited rock has been an influential player in the New Orleans music scene, with founder and keyboard/lead vocalist Sue Ford leading the way, Pink Slip started as a way to get the girls out there in New Orleans music. We were supporting our guys in their bands, lugging all the equipment, being good girlsand I thought, wait a minute, WE need to get out there and prove that there are talented female rockers in this city. Now the guys are hauling our amps! This year, Pink Slip plans to play lots of new material, original songs and classic rock and disco covers. The band is a crowd favorite every year and cannot be missed as they ride by bedecked in pink feather boas. 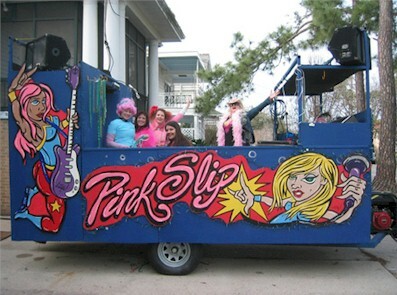 Pink Slip rents the float from the Lyons Club, with a hand painted Pink Slip Mural by a local artist Steve Williams of 504whatstyle on each side (see attached photo). The ride along the parade route is a lot like being on tour, said Rachelle OBrien, Percussions and Vocals, You have to play for six hours straight and cannot get off the float. There are a half million people in the audience, and it only makes you perform that much better, that much faster. We love every minute of it. On January 18 and 19, the girls of Pink Slip and Manwitch will be holding a Mardi Gras to Memphis concert event in Memphis, TN at the Poplar Lounge to thank the people of Memphis for their hospitality when they evacuated there during Hurricane Katrina. The event will be a true Mardi Gras party with king cake, beads, artwork, costuming and several bands.